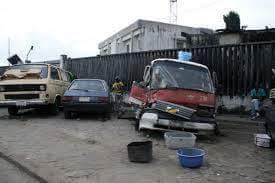 In furtherance of its spirited effort to make Lagos State cleaner, healthier and more liveable, the Lagos State Government has established a special task force for the removal of abandoned and disused vehicles and tricycles littering the State. Similarly, the State Government has appointed vehicular scrap collection agent in line with Section 56 sub-section (1) of the Lagos State Harmonised Environmental Law, 2017 whose activity will commence from Saturday, July 1st 2017.
ii. Upon expiration of the grace period, identified abandoned vehicles will be removed by the taskforce to a designated depot within the State. iii. Where such vehicles are unclaimed within 30 days, the vehicles will be forfeited to the government and undergo proper disposal accordingly. The General public is hereby advised to comply strictly with this directive while Security agencies are urged to ensure compliance.